Breast reconstruction surgery uses either implants or the patient’s own tissues to restore the breasts to a more normal-looking shape and appearance. It is often used after a patient has undergone a mastectomy, a lumpectomy or other trauma, and while it can be broken up into several different procedures over a period of time, the initial work can start right when the mastectomy occurs or at a later point. Implant Reconstruction: Dr. Potondy will either place a temporary tissue expander into the breast to create a soft pocket for an implant to be inserted later in an outpatient procedure or, if the procedure is done right after a mastectomy, immediately insert an implant into the site. Either procedure typically involves one to two days in the hospital and four to six weeks of recovery time at home. In the implant exchange, the outpatient procedure has a general recovery period of up to two weeks. Flap Reconstruction: When using the patient’s own tissues for the reconstruction, Dr. Potondy will take muscle, tissue, skin and/or fat from another part of the body—such as the abdomen, back, buttocks or thigh—and insert it into the breasts. Most flap reconstructions will require hospital stays of three to five days, although that can be shorter with a back donation. Recovery usually takes several weeks or up to several months, depending on a variety of factors. Following surgery, the patient may have gauze and bandages on incisions and a support bra or elastic bandages on her breasts. 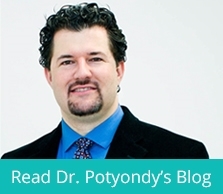 Dr. Potyondy will provide specific instructions about caring for the site(s), taking medications and avoiding infection, and following these instructions carefully is the best way to ensure proper healing. While there are no guarantees with breast reconstruction surgery and while additional surgeries may be necessary, most patients experience good outcomes that are long lasting. With time, any scarring, soreness or incision lines will fade, and the shape and feel of the breasts will improve. Follow-up visits, regular self examinations and special attention to breast health will also be important moving forward.